So I decided to jump on the bandwagon with the whole Topshop makeup craze. A bit late I know! The only thing I have tried was when they first started their makeup range and it was one of their lipbalms. I liked it, but wasn't blown away by it so it didn't leave much of an impression. Sorry topshop! Since I've been seeing lots of people rave about their 'Gloss inks', I decided to give it a go. It has also been compared with the likes of YSL glossy stains which I have always wanted to try but never came up with a good enough justification to spend over £20 on a lip gloss! 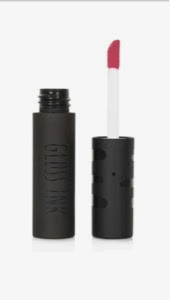 As the Topshop Gloss ink comes in at £8, it seems like a much better deal. I went for the colour called Sugar rush and it is just a more pinky version of your lip colour. The colour looks great, it's not too bold and it leaves a nice healthy, glossy sheen to your lips. HOWEVER, whilst the colour looks great... It pains me to say that it doesn't last long on the lips at all. Maybe 20 minutes tops? As I'm the kind of girl who puts on a lip colour in the morning and then doesn't bother to touch up throughout the day (purely out of laziness), this isn't ideal. I haven't tried out any of the bolder colours yet so those might have a better staying power?